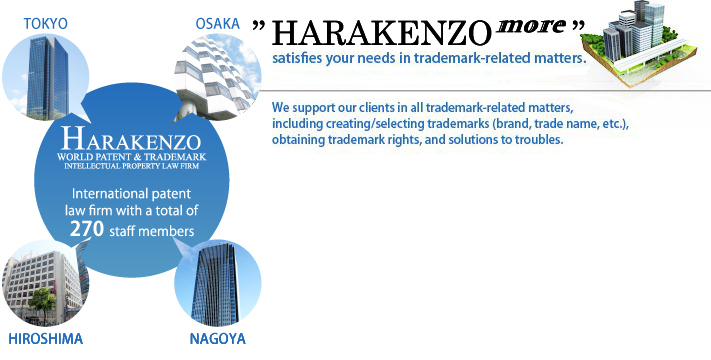 This is a website of the Legal Department of HARAKENZO WORLD PATENT & TRADEMARK, which is the international patent law firm founded in 1976 and has a total of 250 staff members in offices of Osaka, Tokyo, Hiroshima and Nagoya. The Legal Department has patent/trademark attorneys and other staff members (including foreign staff members) and offers supports and consulting services in intellectual property matters such as trademark applications, anti-counterfeiting measures, design applications, and copyright matters. Through our wealth of knowledge and experience on global intellectual property matters, we provide you with practical and timely assistance in obtaining useful trademark rights and in your overseas trademark registrations involved in your overseas expansion. We provide you with assistance in obtaining trademark rights. HARAKENZO WORLD PATENT & TRADEMARK is a large-scale firm having a total of 250 staff members, including foreign patent/trademark attorneys, and foreign staff members. 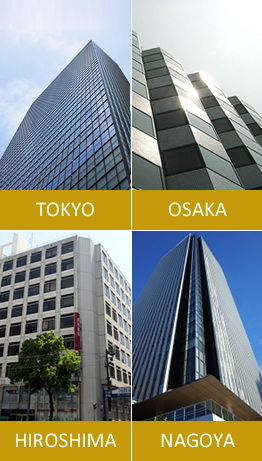 "HARAKENZO more"'s Osaka Head Office, Tokyo Head Office, Hiroshima Office and Nagoya Office are all equipped with high-security, sophisticated IT equipment and television conference systems, which enables us to respond to any requests and inquiries from all our clients anywhere in Japan and in the world. We ensure to satisfy your needs through our staff members best suited for each individual case with our concerted efforts. 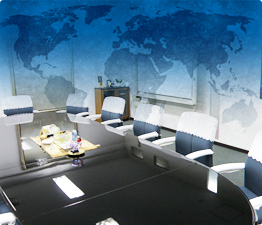 Through our seamless team approach including due considerations and multiple checks by our professional staff members thoroughly experienced in intellectual property practices, we offer “courteous, proper, and quick” legal services of high level, making the most of our ability unique to the “large-scale, international, integrated, intellectual property law firm”. "HARAKENZO more" has established the trademark-specialty department having many patent attorneys and paralegals specialized in trademark practices with a view to obtaining the “strong” trademark rights that enhance the branding strategy of our clients. In addition, "HARAKENZO more" also has established a global network spanning the countries worldwide by building a system of cooperation with the overseas law firms. Through such a global network and our wealth of experience and expertise, we ensure to satisfy all your needs through our speedy, high-quality legal services in domestic and international trademark-related matters, including developing the branding strategy of our clients, creating/selecting a trademark (brand, trade name, etc. ), trademark search, procedures from the filing of a trademark application to the obtaining of a trademark right, legal measures against infringement and counterfeiting by the third party, and negotiation relating to a licensing agreement. "HARAKENZO more" continues to focus our efforts on supporting our existing clients and new clients of the small and medium-sized enterprises and private shops in a variety of industries. We support every single client of the small and medium-sized enterprises and private shops to the best of our ability, with our courteous legal services unique to "HARAKENZO more", which is the “large-scale, international, integrated intellectual property law firm” of proven reliability and experience. ■Is This an Infringement on an Intellectual Property Right? ■Click here for trademark-related news.